This is the last new Random Encounters you will ever read in 2012. Shed a tear. Okay. Now that you're done crying, let's talk new years. I imagine that 2013 will be an interesting year for JRPG fans in both good and bad ways. So I've drawn up ten JRPG-related predictions—some ridiculous, others not-so-ridiculous—for the Year Of Our Lord Two Thousand Thirteen. 1. Ni No Kuni Will Bomb. It makes me sad just to write this, but I think the first big JRPG of 2013 will be a sales flop. 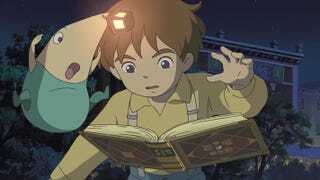 Critics will love Ni no Kuni, but it will ultimately fail to garner much of an audience thanks to its strange name and lack of mainstream retail exposure. I imagine I will still enjoy the heck out of the game. 2. Square Will Reveal That Final Fantasy Versus XIII Is Now Final Fantasy XV. They'll realize that the XIII brand is way played out, and show off the newly-named Final Fantasy XV at E3. It will be stunning, and it will hit Durango and Orbis in spring 2014. 3. Lightning Returns: Final Fantasy XIII Will Be Surprisingly Good. I couldn't stand Final Fantasy XIII and I thought its sequel was just as dull, but I have a good feeling about Lightning Returns, despite the tepid reactions it's earned from fans so far. The gameplay sounds unique and interesting. I think it could be a cool game. 4. One Western Developer Will Make A JRPG. 5. At Least One Big JRPG Will Come To Wii U Next Fall. Maybe a Final Fantasy spinoff in the vein of Crystal Chronicles, or maybe even a Tales game. Dunno. But I think JRPG fans with Wii U's will have something to play by the end of 2013. 6. Final Fantasy IV Will Be Released On At Least 7,000 More Devices. Not content with just letting you play Final Fantasy IV on your Super Nintendo, PlayStation, PlayStation 3, Wii, Wii U, DS, iPhone, iPad, WonderSwan, Game Boy Advance, and PSP, Square Enix will re-release Cecil's adventures a few more times. You'll now be able to play Final Fantasy IV on Xbox 360, Xbox 720, PlayStation Orbis, Vita, 3DS, Ouya, PC, TI-84 graphing calculators, toasters, Flash browsers, dogs, coffee mugs, voice recorders, Google+, blueberry pies, packing tape, and the Times Square Jumbotron. 7. A Much-Requested Game Will Be Localized. Not a new one, like Bravely Default: Flying Fairy (which, bonus prediction, I think will come to America next summer). I'm thinking an older one, something that most people thought had no chance of ever making it to U.S. shores. Wild guess: Valkyria Chronicles 3. 8. Square Will Announce A Direct Sequel To Final Fantasy VI. Fans will go crazy. A new story in the world of Final Fantasy VI? Bloody fantastic. Then Square will announce that it's a free-to-play browser game, and we'll riot in the streets. 9. 2013 Will Be The Year Of Indie 2D JRPGs. More than any year before it, 2013 will see tons and tons of high-quality JRPG-style games made by Western designers. Some will come out of the blue; others will come from Kickstarters launched in 2012. All will add to our ever-growing backlogs. 10. Every Single Kotaku Reader Will Play Suikoden II. Look, everyone needs goals. Mine is to get you to play Suikoden II. So either start now, or wait for the subliminal messages that start appearing in every article I write next year. Your call. Random Encounters is a weekly column dedicated to all things JRPG. It runs every Friday at 3pm ET.